Listen for the children's choir singing "Freedom is Coming"! 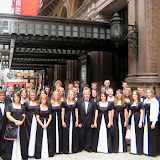 On Sunday, June 14, 2009, the WLA Traveling Choir, under the direction of Almeda Berkey, preformed Jackson Berkey's "Thoughts & Remembrances" at Carnegie Hall in New York City. Previously, the Traveling Choir had sung Jackson Berkey's "South Dakota Shadows" in June 2007 and Randall Thompson's "Frostiana" in April 2004. Click the picture below to go to my Picasa photo album of some of the many pictures I took on the WLA Traveling Choir's third performance at Carnegie Hall in New York. When you arrive at the Picasa page, click on "Slideshow" in the upper left hand corner to view the pictures. I haven't captioned the pictures yet, so until then, you can check out our itinerary and try to guess where all the shots were taken. If any trip participants have photos they would like to add to my photo gallery, please email them to me. There are four times on our trip that you will have free time to explore New York City. Those four times are listed in red in the itinerary below. I want you to plan ahead what you are going to do during those four times so that you can maximize your sightseeing experiences. Figure out (1) what you want to see (2) when you are going to try to see it, (3) how you are going to get there, and (4) who is going with you. Use the MTA NYC Subway Map and Trip Planner to get a good idea of which subway line to take and how long the ride is. Your can even print out your subway trip plans! Use Google Maps or MapQuest to find NYC cross streets and sightseeing locations. I'll be bringing NYC guide books along on the bus if you still aren't sure what you'd like to see or where it is. Then fill out a Flight Plan and bring it along on Wednesday. You can always change your plans. Just come with a plan. Only ONE DAY MORE before we go!!! Lunch at rest stop along the way. You may bring your own sack lunch. 5:30 AM: Lamers Bus to arrive at Trinity Lutheran Church. Load and leave by 6:00AM. Call Mr. Witte after your musical is done. Sun., June 14, 2009 – CONCERT DAY! 8:00 AM: Lamers Bus to arrive at Grand Hyatt Hotel. Load and leave hotel by 8:30AM. Bus will drop us off at Battery Park, NYC and we will take ferry at 10:00AM to tour Ellis Island and Statue of Liberty. While we are touring Ellis Island/Statue of Liberty, bus will go to Liberty State Park in Jersey City, NJ. We will take the ferry from Ellis Island to Liberty State Park. 7:00-9:00 AM Arrive at WLA. Unload. Collapse.